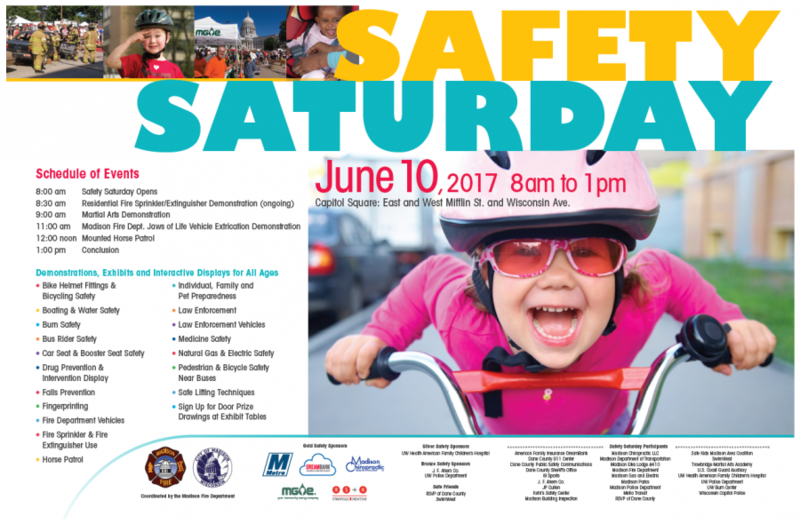 Join the City of Madison Fire Department and its community partners along Mifflin Street and Wisconsin Avenue for safety demonstrations, exhibits, interactive displays, and more. Each year, this free, family-friendly event offers opportunities to learn how to live, work, and play safely in our community. Get tips on proper bike helmet and car seat use. Learn about electrical, gas, and carbon monoxide safety. Tour an ambulance, fire truck, the Madison Fire Department Hazardous Incident Team trailer, and much, much more. Safety Saturday is a cooperative effort between the City of Madison Fire Department and more than 25 public and private organizations throughout Dane County aimed at educating people of all ages.